A newer showroom specializing in custom window treatments, home furnishings and lighting. Established in 2013 we offer a full showroom located at 108 Holloway Rd in Ballwin, Mo. St. Louis Blinds and Shutters is in the same building as House In Style, a full service home furnishing store with professional interior designer/decorator and owner Sandy Harms here to answer your home furnishings/decorating questions. We sell everything from traditional blinds to modern shades to plantation shutters. No window or project is too big or too small for us. We have a solution for any window. Come by and visit our showroom or call us today 314-574-6035 FREE MEASURING, FREE IN-HOME ESTIMATES, FREE INSTALLATION. Windo Van Go makes selecting and ordering your custom plantation shutters & honeycomb shades easy and efficient. free. Windo Van Go sells all major brands like Hunter Douglas, Skandia, and Kathy Ireland Home. And we sell a wide variety of coverings for the windows from shutters and shades to draperies and bedspreads and everything in between. We do all this in the comfort and lighting of your own home or office. FULL Selection of Name brand Window Treatments: + Vinyl/Wood Plantation Shutters + Draperies/Curtains + Wood/Faux Window Blinds + Honeycomb Shades + Roller Shades + Silhouettes Shades + Vertical Blinds + Wood Corninces/Valances + Miniblinds...and More!!!! Satisfaction Guaranteed!! Interiors by Bethlyn offers custom window treatments and residential interior design services in the St. Louis, MO and Illinois Metro-east areas. 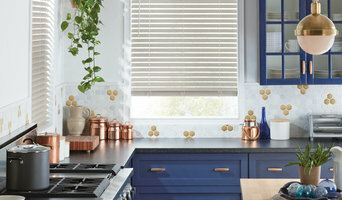 We carry the full line of Hunter Douglas blinds, shades and shutters as well as beautiful designer fabrics. Consultations for window coverings are always complimentary and at your convenience in your own home. Color and design consultations start at 75.00. Bethlyn is an accomplished window treatment designer and decorator since 1999. She completed her interior design training through the New York Institute of Art and Design, and also received training in interior redesign from Lauri Ward, author of Use What You Have Decorating. Discount Draperies specializes in creating a custom look while keeping your budget in mind. With Discount Draperies, you will feel confident from start to finish. We offer in-home consultations. This way you can select the fabric that best suits your needs from the comfort of your own home. Owner of Windows and More by Chrystal. I am a home based workroom studio, that works with designers and clients to make beautiful window treatments, bedding, slipcovers, and upholstery for their homes. Flanagan Paint & Supply is the premier full service decorating retailer in the St. Louis area. We offer superior service to customers ranging from homeowners. to contractors. to corporate America. Every product we sell is hand-selected by our experienced staff to emulate our emphasis on providing superior quality and function. We are committed to ensuring that your decorating projects are enjoyable and successful! Sunshine Drapery serves residential and commercial customers within a 100 mile radius of St. Louis Missouri..covering Missouri and Illinois. Our business focuses on complimentary appointments where one of our experienced designers comes to your home or business any day, evening, or weekend...we make our own draperies with our seamstresses in our Maryland Heights 25,000 square foot workroom. We assist customers with draperies, blinds, shades, shutters, bedding, pillows, cushions, reupholstery and more....we also have design stores with displays located in Chesterfield Missouri and Sunset Hills. Sunshine has been in business since 1969 and proudly employs 45 associates. Edwin Pepper Interiors is a full-service, family-owned interior design firm based in St. Louis, Missouri, known for sophisticated, high-quality design. For nearly 50 years, Edwin Pepper has provided exquisite interior designs for local, national and international clients. Our talented, professional interior designers work closely with you to create elegant spaces that fit your style, character and budget. Edwin Pepper represents some of the finest furniture manufacturers available, and we have our own on-site drapery workroom that provides custom pieces. We invite you to schedule an appointment with one of our designers at your home or at our temporary location on North Warson Road. JEM Personalized Interiors works in greater St. Louis area to fashion innovative and unique window treatments to enhance your home or office. Certified (CWFP) (WCAA) and committed to bringing you ideas and sources to enhance all areas of your home. 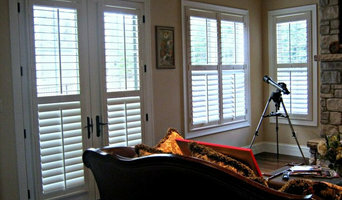 BlindAmbitionSTL, your source for custom window treatments; Shutters, Shades and Blinds. Serving St. Louis, Franklin, Warren, and St. Charles counties. Hello my name is Christine Colona I am your local 3 Day Blinds Design Consultant serving St Louis Missouri Area. I have been designing window treatments since 2013 I have worked with many of your friends, family members and neighbors in providing quality service and window treatments. While enjoying what I do, I have been able to offer solutions to everyday problems such as heat efficiency, child safety, light control and finding the right balance for your decor. In addition, I will coordinate beautiful colors, patterns and styles to compliment any home or business. It's all in the details. At 3 Day Blinds, we will build your custom made window treatments to suit your needs, guiding you through the process every step of the way. You will enjoy choosing your Blinds, Roman Shades, Woven Wood Shades, Honeycomb Shades or Shutters in the comfort of your own home or office. Together we will be able to make your vision for your large or small scale project a reality. All the while instilling confidence with competitive pricing that will accommodate any situation. With professional measuring and installation we will ensure it is made and installed to suit your specifications. With 33 years in the window covering industry we take pride in providing quality products, knowledge, expertise, confidence and joy to our customers as we bring your dreams and plans to life. Please contact me to arrange for your FREE in-home consultation. I look forward to meet you soon! Unlike curtains, blinds and window film, Halcyon Shades provide indoor sun shade during warm months and radiant heat during winter months. Call (314) 282-8088 to be efficient with Halcyon Shades. Custom Creations is a custom drapery workroom that works with designers and clients on fabrication for window treatments, pillows, bedding and cushions.